This tab is meant for submission of declaration by the bidder regarding validity of original offer in case of negotiations. The bidder has to select date upto which the original offer shall remain valid. The date selected should be at least 30 days from the closing date for submission of negotiated bids. The bidder has to tick the check box available on the page otherwise he will not be able to submit the negotiated offer. 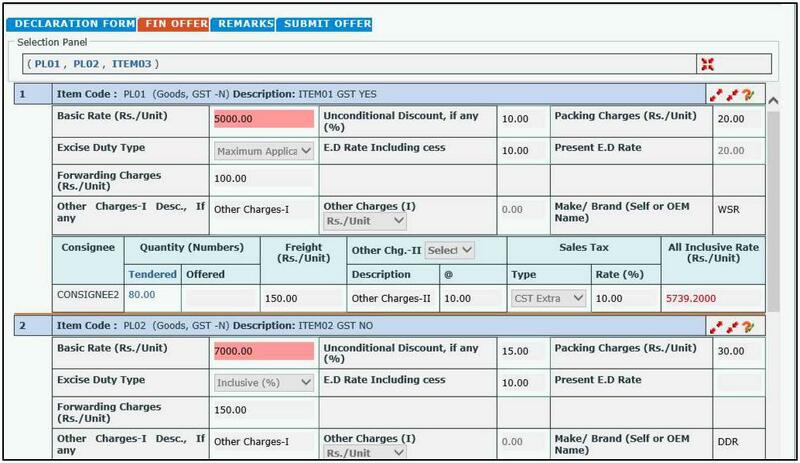 In case of indigenous offers, or in case of Service/ AMC item types for import offers the Basic rates, Packing Charges, Forwarding Charges, Freight Charges, Rates of Sales Tax/ GST/ Excise duty etc. (wherever applicable) cannot be increased. Unconditional Discount cannot be decreased. Type of charge i.e. 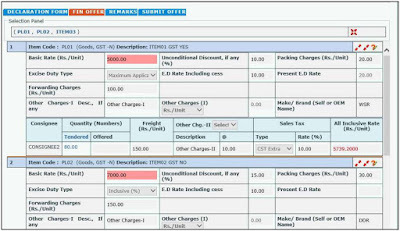 ED Type, Sales Tax Type, Other Charges – I and Other Charges- II Unit and Description etc. cannot be changed. Offered quantity cannot be modified. In case of import offers Basis of offer cannot be changed, FOB charges, Insurance Charges, Agency Commission and Transit freight charges cannot be increased. This tab is meant for entering remarks for various purposes like withdrawal of deviations, clarifications etc. This tab is available only if the bidder has permitted the same while issuing the negotiation letter. This tab is meant for submission of the complete negotiated bid, and it works in the same manner as the submit offer tab for the original offer. The bidder has to fill in the required details in all the tabs, and then click on the Encrypt and Submit button to submit negotiated offer.